Grant Ginder was at Greenlight Bookstore in Fort Greene to launch his third novel, The People We Hate at the Wedding. 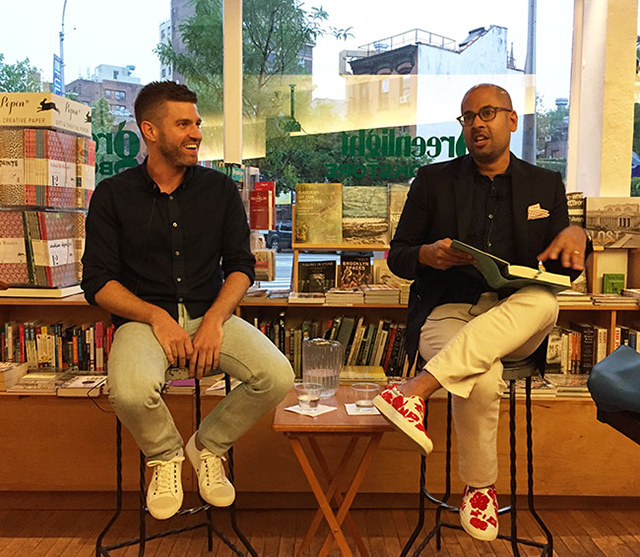 He was joined in conversation by Rich and Pretty author Rumaan Alam. At the heart of The People We Hate at the Wedding is the relationship of three siblings. Paul and Alice grew up leading lives as ordinary middle-class Americans, but their half-sister, Eloise, enjoyed the life of a wealthier European aristocrat. The family converges on London to celebrate Eloise’s wedding. Hijinks ensue. Ginder read from a section of the novel where Alice arrives in London to find her sister has paid for her hotel room. This naturally infuriates Alice and she does the only thing she can think to do: order a lot of room service. Alam begins the discussion with character likability. He notes that when his own novel launched, there was a great deal of interest surrounding how unlikable his characters were. Likability wasn’t on Ginder’s mind when he created the characters. He had a mantra while writing them: “kick them while they’re down.” Each of the characters, as the title suggests, has strong feelings towards the others. As narrative perspective shifts during the novel, so does the perspective of who is likable or not. Ginder admits to having read some of the early reviews on GoodReads. He jokes that all writers, even if they say they don’t read those reviews, actually do. Of those reviews, plenty of readers were totally fine with the unlikability of the characters. These characters are damaged people, he explains. People don’t read fiction for likable characters, he says. We need fiction to learn to empathize with people. All the characters are flawed in their own way just as real people have flaws. What is unique about these characters is that they are siblings, yet have had wildly different upbringings. They are linked as family members but distanced by their experiences. The narrative shifts perspective between the characters. In part this was to build sympathy for each of the characters, but also because of how their stories intersected each other. Structurally, Ginder wanted to give his characters room to breath. Ginder, who has a brother, explains that siblings have a unique ability to hurt each other. Having grown up together, they know how to best hurt each other in a way only siblings really know how to do. Although he did attend a wedding in the United Kingdom, this novel is not based on Ginder’s life. He does say though that he draws on his experiences as a son and as living in an imperfect family has informed his knowledge. “My mother does have the tendency to read herself into every mother I write,” he laughs. Ginder says that he often imagines what it was like raising him, and what it is like to continue to raise him even though he is an adult, and that informs his writing. Kids are dicks to their mothers, he says, and yet mothers still love their sons. The novel is written in the present tense, a decision that came after Ginder began writing. He explains that he started writing the novel in the past tense, but he kept slipping into the present. The present tense has the effect of allowing the characters to be in their own heads. It also made the two flashbacks a bit easier and more clear. The most important effect was in creating a sense of urgency within the text. When he first started writing the novel, he wasn’t sure what role the wedding would play. Ultimately he decided it was more the end goal of the novel rather than the main event. Weddings are less interesting than the drama of getting to them, of the participants and family learning to love each other. The title of the novel came first. He and some friends were at a wedding on Long Island and returning by train. They had stolen some bottles of wine from the reception and drank most of it before the train had returned to the city. One of his friends suggested they play a game of who they hated at the wedding. Ginder took notes, and in the morning after, when he looked back at his phone, knew he had to write a novel with that title.